SKU: N/A. Tags: Brass Knuckles Oil Cartridge, Brass Knuckles Vape Cartridge, Brass Knuckles Vape Oil Cartridge, Brass Knuckles vape Oil cartridges. 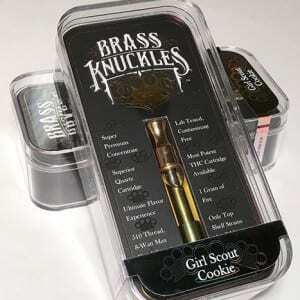 Brass Knuckles stands by their brand and produces the top cartridges on the planet. Each cartridge is clear and tests above 70% THC. Usage: Unwrap the packaging and start to use the Brass Knuckles Oil Cartridges by connecting the Vape cartridge to your battery device. Enjoy as the smooth smoke enters your lungs.